FRANKFORT – The Kentucky Department for Public Health (DPH) is reporting four human cases of West Nile virus infection in Kentucky residents. To date, 42 states and Washington, D.C. have reported West Nile virus infections in people, birds, mosquitoes, or horses in 2017. Kentucky’s four human cases include residents of Fayette (1), Hopkins (2), and Jefferson (1) counties. All cases have occurred in adults. 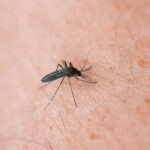 Between 2012 and 2016, Kentucky has averaged about 10 cases of West Nile virus, which is occurs following the bite of an infected mosquito, per year. The virus is known to be present in mosquitoes in Kentucky. DPH continues to work with local health departments and the Kentucky Department of Agriculture to control and aid in West Nile virus surveillance and mosquito control. In most instances, people infected with the West Nile virus either show no symptoms or relatively mild symptoms, including fever, headache, body aches, joint pains, vomiting, diarrhea, or rash. Less than 1 percent will develop a serious neurologic illness such as encephalitis or meningitis (inflammation of the brain or surrounding tissues). People over 50 years of age and those with certain medical conditions, such as cancer, diabetes, hypertension, kidney disease, and organ transplants, are at greater risk for serious illness. Use insect repellents when you go outdoors. Repellents containing DEET, picaridin, IR3535, and some oil of lemon eucalyptus and para-menthane-diol products provide longer-lasting protection. To optimize safety and effectiveness, repellents should be used according to the label instructions. More information about insect repellents can be found at http://www.cdc.gov/westnile/faq/repellent.html. When weather permits, wear long sleeves, long pants and socks when outdoors. Mosquitoes may bite through thin clothing, so spraying clothes with repellent containing permethrin or another EPA-registered repellent will give extra protection. Don’t apply repellents containing permethrin directly to skin. Do not spray repellent on the skin under your clothing. Help reduce the number of mosquitoes around your home by emptying standing water from flowerpots, gutters, buckets, pool covers, pet water dishes, discarded tires and birdbaths on a regular basis. There are no medications to treat, or vaccines to prevent West Nile virus infections in humans. People with milder illnesses typically recover on their own, although symptoms may last for several weeks. In more severe cases, patients often need to be hospitalized to receive supportive treatment, such as intravenous fluids, pain medication, and nursing care. Individuals who think they may have a West Nile Virus related illness should visit their healthcare provider for proper diagnosis and treatment. In addition to human cases, West Nile virus infections have been reported in horses and mosquitoes in Kentucky. Four horses have tested positive in the following counties: Bourbon, Franklin, Hart, and Russell. West Nile virus does not usually affect domestic animals, but can cause severe illness in horses and certain species of birds. Although there is no vaccine available for people, there are several vaccines available for horses. Owners are advised to vaccinate their horses annually. Mosquito surveillance activities are ongoing in locations across the state. Local health departments set traps to collect mosquitoes. Mosquitoes are then identified by genus and species. Mosquito species known to transmit diseases are tested for West Nile virus and other mosquito transmitted viruses. Earlier this week, the Louisville Metro Department of Public Health and Wellness found West Nile-infected mosquitoes in their surveillance traps. To date, there have been no other positive reports of WNV-infected mosquitoes in Kentucky. Mosquitoes have also been tested for Zika virus and St. Louis encephalitis virus; there have been no positive reports for these viruses in 2017. More information can be found online at: https://www.cdc.gov/westnile/ or http://www.chfs.ky.gov/dph/epi/westnile.htm. Additional information is available at http://chfs.ky.gov/.